How often should I brush my teeth? Teeth should be brushed AT LEAST twice a day, once in the morning and once before bedtime. These times are crucial. More frequent brushing after meals, snacks and sugary beverages is desired. If once cannot brush throughout the day, it is recommended that one chews sugar-free gum after snacks and sweet drinks. How often should I floss? One should floss at least once daily. Children, however, often need assistance flossing due to their limited dexterity so an adult should assist with flossing until they are able to floss effectively without damaging their gums. What technique should I use when brushing? Children and adults should brush in a circular motion for at least two minutes at a time, unless otherwise instructed by their dentist. Why is Fluoride important? Fluoride is proven to make teeth more resistant to decay and it helps repair tiny areas of decay before they become cavities. What products contain Fluoride? 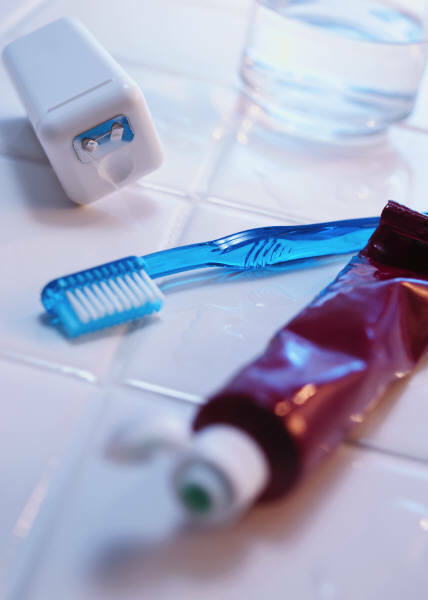 Fluoride is found in many tooth products, such as toothpaste and Fluoride rinses. In addition, many city water supplies are fluoridated. In many schools, a Fluoride mouth rinse program provides a weekly rinse for children's teeth. What is a dental sealant? A dental sealant is a thin, plastic coating that is "painted" onto the chewing surface of the tooth to help prevent decay. Dental sealants are primarily used on the molars and are particularly effective in children with deep pits and fissures in their teeth. How are dental sealants applied? First, the tooth is cleaned. Then a mild etchant material is placed on the tooth to roughen the surface. A sealant material is then placed on the tooth and a curing light is used to harden the sealant into place. The application of the sealant requires no drilling or shots and is completely painless. How long will dental sealants last? A dental sealant should last at least five years and often lasts longer. Why should a child have dental sealants? Sealants are used to keep an already healthy tooth from decay. Most of us are accustomed to the concept of fillings. The problem with fillings is that each time a tooth is filled or a filling is replaced, part of the tooth is lost. Regular fillings need to be replaced every 8 to 10 years. A sealant is a preventative measure that can help avoid decay before it begins.